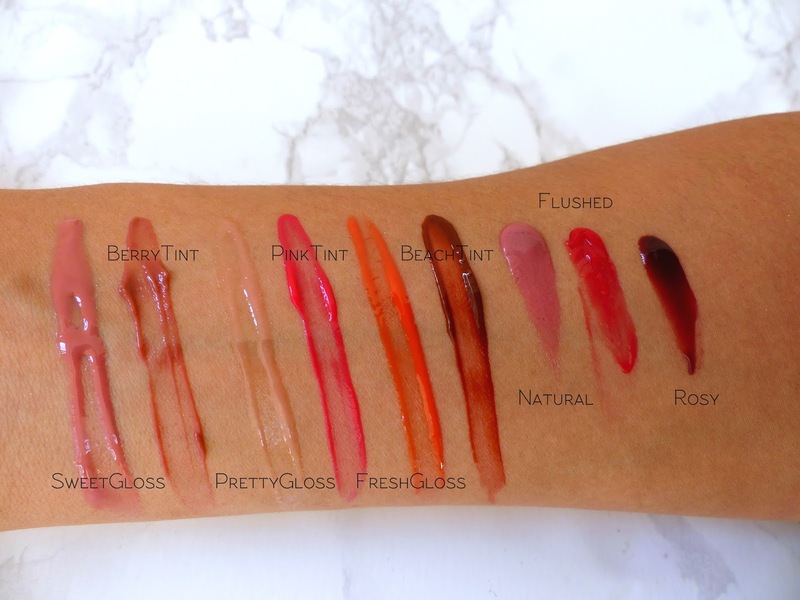 Pixi GelTint & SilkGlosses in BeachTint & FreshGloss, PinkTint & PrettyGloss and BerryTint & SweetGloss* | £14 each | This is a really interesting concept; a minty-flavoured dual-ended lip product, with one side being a lip gloss and the other side a tint. The tint has an unusual texture but does matte down in a way that feels comfortable and is incredibly long-lasting. I've mentioned before that the Pixi lipgloss formula is one of the few I actually like! It's nothing overly sticky and gloopy and gives a surprising amount of pigment. You can wear the two shades separately or layer them up. BeachTint is a berry tone (probably the most pigmented tints in this collection) and FreshGloss is a vibrant orange, so whilst I like both shades individually, I wouldn't layer them up. PinkTint & PrettyGloss contains a bright pink tint and light, sheer pink gloss, which isn't really my thing personally. Finally BerryTint is a berry-mauve colour and SweetGloss a pinky-mauve; these two are the least pigmented but make for a pretty everyday lip. Pixi Sheer Cheek Gels in Natural, Flushed & Rosy* | £14 each | I kind of knew from the name that these wouldn't be my thing, but I tried them and was proven correct! I have combination skin that can get quite shine-prone during summer, so a gel texture was never really going to work out for me... They give a very natural tint and the dewy look of these might work for dry skin, however for me they just don't last. Natural is a pinky-mauve with a slight sheen (and the least pigmented), Flushed is a wine tone and Rosy a pinky-red. Smashbox Cover Shot Eye Palette in Ablaze | £24 | I honestly don't know how it took me so long to pick this up as I've had my eye on it for ages! These palettes are so slimline and the warm tones mean this could very well be my perfect summer eyeshadow palette. 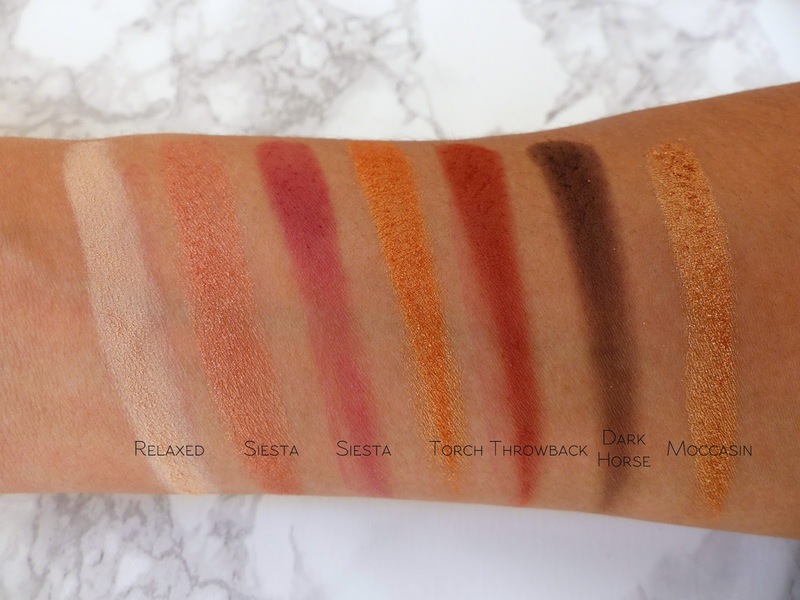 You have crease shades, lid shades, some pops of colour and a few darker tones (side note: apologies that I neglected to swatch the red-bronze shade Delirious below!) I'm really impressed with both the pigmentation and ease of blending with these eyeshadows. The only thing I would say is that the staying power isn't quite as good as it is with my favourite formulas. However in terms of my first Smashbox eyeshadow experience; I like this a lot! Nars Dual Intensity Blush in Frenzy | £30 | I'm not sure how I'd never come across this but Frenzy looks like it was made for me. It contains a light, pearly-gold highlighter (this has a metallic sheen, so isn't at all glittery) and a matte-sheen warm peachy blusher. The pigmentation is absolutely amazing and these can be used either wet or dry. The highlighter is beautiful and much more subtle than you'd expect from the name. The blusher is also lovely, adding a nice flush of colour and applying evenly, though I do feel the wear-time could be a bit better. 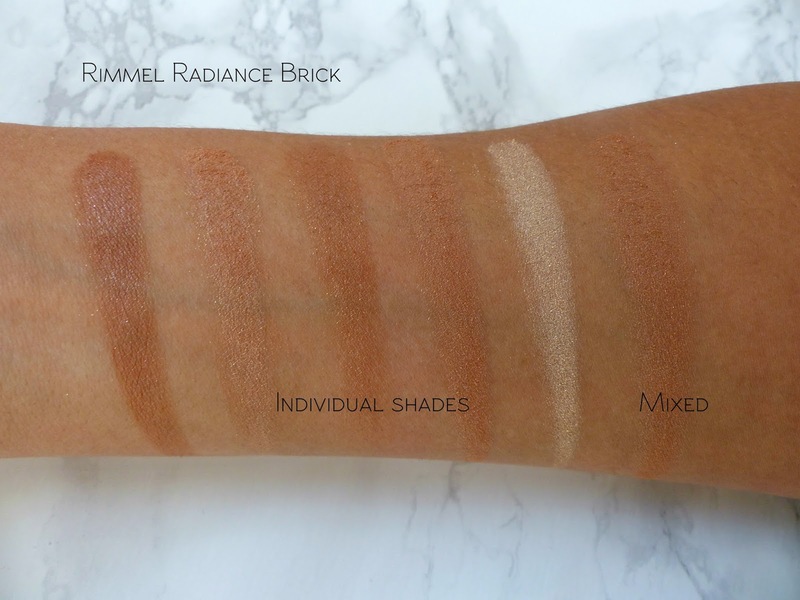 Rimmel Radiance Shimmer Brick in 02 Medium* | £5.99 | I'm always confused as to how products that only come in two shades can label one of them 'medium', but that aside; this is a powder that's more bronzer than highlighter. The sheen it contains is very soft and there are several rows of different bronze shades. For me, it's a bit of a 'middle of the road' product; it's quite subtle on my skin tone and although he formula blends out nicely without being patchy, I felt as though it faded quite a bit throughout the day. AHB Cosmetics Highlight & Strobe Kit* | £59.95 | As gorgeous as this palette looked, I did have serious misgivings about a new brand pricing itself alongside Hourglass, By Terry and Becca, especially as the packaging is cardboard. However once it arrived, I did notice that the pan-size is very similar to individual shades, making them a not-unreasonable £10 each (which is fine if you like and use all of the shades). You get 4 unique-coloured highlighters and two baked blushers in here. 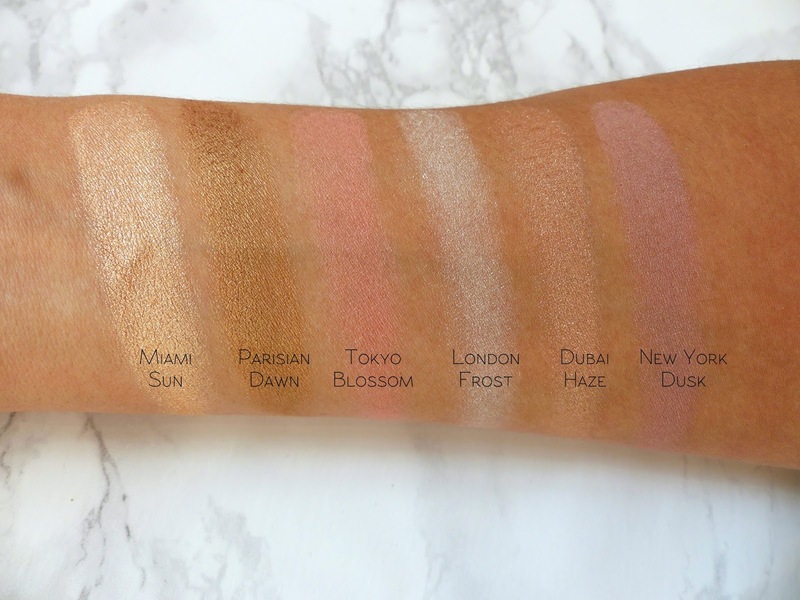 Miami Sun (my favourite and actually a shade I've spent ages looking for) is a gorgeous peachy-apricot, Parisian Dawn a bronze-gold, London Frost an off-white and Dubai Haze an interesting warm red-bronze. They all have a very similar formula, though I'd say the two darker shades are slightly less smooth. They aren't glittery and have a soft texture and good pigmentation. I was less impressed with the sheeny baked blushers though, as they weren't as smooth and didn't have the level of colour payoff that I'd hoped for. Tokyo Blossom is a pink-peach and New York Dusk a cool mauve. You have to layer them up quite a bit and even then it's still a very subtle look. AHB Cosmetics Blush & Highlight Brush* | £20 | This is the other product I got to try from the brand and can we just take a moment to appreciate how pretty this is?! I love the rose gold detail and white handle. It's the perfect brush to use with highlighters that have a stronger colour because it means you can softly brush the product across your cheeks for that all-in-one blusher and highlighter look. It also really works well for subtly applying your blusher. Benadryl Allergy Face Kit*: Neutrogena Hydro Boost Water Gel Moisturiser, Max Factor Green Colour Corrector Stick, Rimmel Soft Kohl Kajal Eyeliner in White & Bourjois Rouge Edition Lipstick in 11 | As someone who suffers quite badly with hay fever (I'd made it to the grand old age of 22 without ever getting it but now suffer quite severely), I absolutely loved the idea of this! Hay fever can leave me with twitchy, red, watery eyes and feeling so stuffy overall. I find the best tactic is to take a decongesting antihistamine tablet in the morning after brushing my teeth to prevent the symptoms and keep a nasal spray in my handbag in case I need a top-up during the day when there's a particularly high pollen count (both available from Benadryl). This kit contains a lightweight gel moisturiser from Neutrogena which is perfect to add a splash of moisture that isn't too rich for shine-porone skin, a colour-correcting stick from Max Factor (unfortunately this shade is too light for me but green counteracts any red you might have around your nose or in your cheeks when your allergies are playing up), a white kohl liner from Rimmel (used on the waterline, this gets rid of any redness and makes you look bright and awake, plus the formula is nice and creamy) and this gorgeous, cream-textured pinky-coral lipstick from Bourjois to perk up your complexion. I absolutely love the idea of this - it's perfect if you, like me, find that allergies often show on your face! Rimmel Super Gel Nail Polishes in 35 Coral Queen, 82 Purple Splash, 53 Dive Right In, 26 Sun Fun Daze, 45 Flamenco Beach & Topcoat* | £5.99 each | Annoyingly the blue shade Dive Right In seems to have gone walkabouts...luckily it's the one I wasn't really reaching for anyway! Bringing out at-home gel polishes seems to be the latest trend, which is perfect for holidays, when you just want to put on a colour and have it last the entire time that you're away. Plus these shades are perfect for summer! Coral Queen is bright orange, Purple Splash a light lilac, Dive Right In a light, bright blue, Sun Fun Daze a fuchsia pink and Flamenco Beach a vivid, true red. I wouldn't say they're as chip-proof as the name led me to believe and I don't think this top coat is absolutely necessary (whichever one you already have will do) but they last decently and have a nice, opaque application. Living Sea Therapy Renew Foot Cream* | £18 | As it's now summer, my feet are coming out a lot more often because I love wearing strappy sandals! Obviously that means taking care of my feet a bit more and I've really been enjoying this lightweight cream. It's hydrating without being overly greasy and leaves my feet feeling soft and smooth. It has an invigorating, slightly minty scent. Soaper Duper Yuzu Fruit & Fig Body Butter* | £10 | This is a more lightweight body butter, so doesn't have a slippery finish at all. I actually quite like this scent, it's quite an unusual fruity fragrance. It's nice and hydrating, leaving my skin soft and smooth, however might not be for you if you have really dry skin. Soaper Duper Yuzu Fruit & Fig Body Wash* | £6.50 | This is a body wash that comes in the same scent. I actually really the formula of the shower gels as they're so nice and foaming! Plus you get such a huge bottle for your money, so it's a total bargain. Nspa Coconut Shower & Bath Gel* | £3 | This fruit extract collection comes in at such an amazing price-point and these shower and bath gels remind me a lot of the 2-in-1 products that Philosophy do. This has a sweet and creamy coconut scent (which stays on the skin after use) and gives amazing bubbles. It has a creamy consistency so feels nice and hydrating on the skin. Nspa Pinapple Shower & Bath Gel* | £3 | The formula of this one is very much like the Coconut-scented version. I'm not the biggest fan of this fragrance as it's super-sweet and I think for something pineapple-flavoured, I'd prefer a fresher feel, however that's just me! Nspa Raspberry Shower Scrub* | £3 | This isn't really the product you reach for when you have seriously dry skin on your body, however it's a great one for everyday smooth skin maintenance. It's more like a scrub/cream formulation with a berries and cream scent. It's very gentle but is a nice option for regular use to keep your skin soft. Nspa Shea Body Butter* | £3 | This is a slightly heavier body butter formula, though it isn't too slippery on the skin. The scent is quite light but I do still really like it. If you have very dry skin that you want to look nice and smooth for the summer then definitely check this affordable option out. Iluminage Precise Touch Hair Remover* | £240 | I've been using this laser hair removal system for a good 2 months now, and so far, so good! You use this device on freshly-shaven skin and you can select from 3 levels of intensity. You should go over each area you want to remove hair from 2-3 times. I'll keep you posted but so far I am noticing that hair is growing back softer and finer. It's a great one to use as part of your holiday prep if you don't want the fuss of regular hair removal. By Terry Tea to Tan Face & Body Spray* | £34 | This is a tanning product in mist form which contains a very subtle, fine sheen and has an amazing fragrance. It adds colour to the skin in a way that's very subtle and not at all orange. It doesn't go streaky on me and looks very natural. I'm loving this at the moment because my body is always more tanned than my face, so this helps even things out perfectly. The Wet Brush Pro Night Floral* | £12.99 | I've been a fan of the Wet Brush for a while, but have only ever had the mini version. This is the full-sized and comes in this gorgeous black, gold and pink floral design. I don't know how it does it but it smoothly and easily detangles the hair after washing. I really don't know what I did before this product came into my life! Caudalie Eau des Vignes Fresh Fragrance* | £26 | This is a really different sort of fragrance for me; as the name promises, it is very fresh but slightly floral (without being overly sharp) and sweet too. The notes include lemon essence, bergamot and neroli. I actually really like this scent; it's beautiful and long-lasting without being overwhelming at all. Roger & Gallet Ylang Fresh Fragrant Water Spray* | £25.70 | This is a lovely light splash of scent for summer. It's a soft, sweet, floral, fruity fragrance created with ylang (of course), orange blossom and vanilla. The price-point is also nicely in the middle, which I like! Which new products have you picked up for summer? Those Pixi Gel tints and glosses look lovely. That ABH highlight and strobe palette is definitely on my wishlist! Those eysehadows looks all so pretty! That smashbox palette is beyond flawless, it has everything you need within it and the colour pay off looks insane! I wish Rimmel came out with more shades in their shimmer brick as that medium would be far too dark for me and I'm assuming the light will also be dark or too light. I haven't tried any of the NSPA body care range but I would recommend trying out their skincare especially their hot cloth cleanser! That AHB Cosmetics brush sounds just like what I need for applying highlighter, and yes it is so pretty! Now I feel like a serious haul is in order... 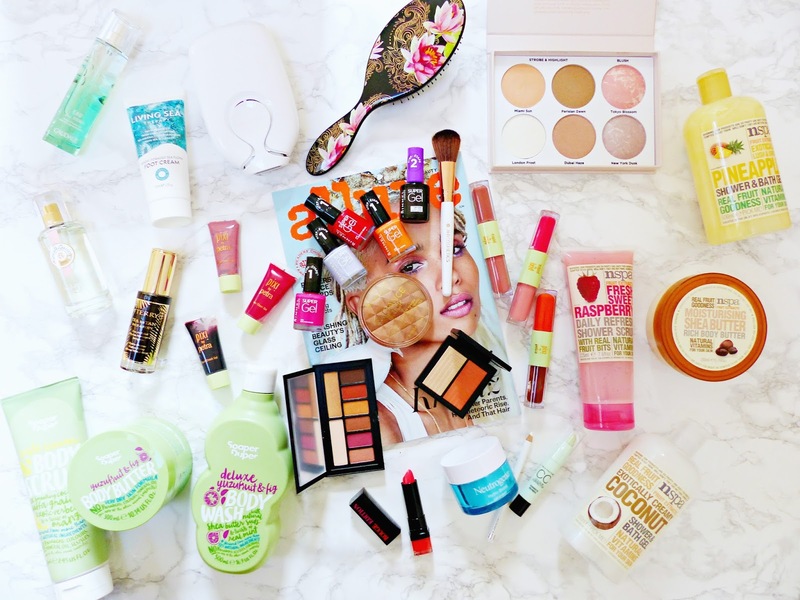 I think a few of these products will definitely be making their way onto my wishlist! That Smashbox Eyeshadow palette looks right up my street! The colours are beautiful. Shame about the staying power but I still want to buy it regardless haha! I love the look of that Smashbox palette - looks so pigmented and those shades are just perfect. I really want to try out some products from Pixi as well so I'll definitely be picking them up soon. There are so many lovely products here, I am going to have to check some of them out! How gorgeous is Pixi's packaging?! Love your photos by the way! So many bright and beautiful colours! Love all the shimmer eyeshadows. That hairbrush is so pretty! I love Wet Brushes, and always stock up on new ones as I keep one just about everywhere so I'm never without it! The Raspberry Shower scrub also sounds delicious, anything raspberry scented is a winner for me! That Smashbox Ablaze palette is amazing! I feel like there's a lot of similar shades to the Modern Renaissance palette, but obviously half the price so I'll be swatching that. I also love the sound of the pixi glosses, I love minty products! I have never tried a wetbrush, always looking for a new one!! 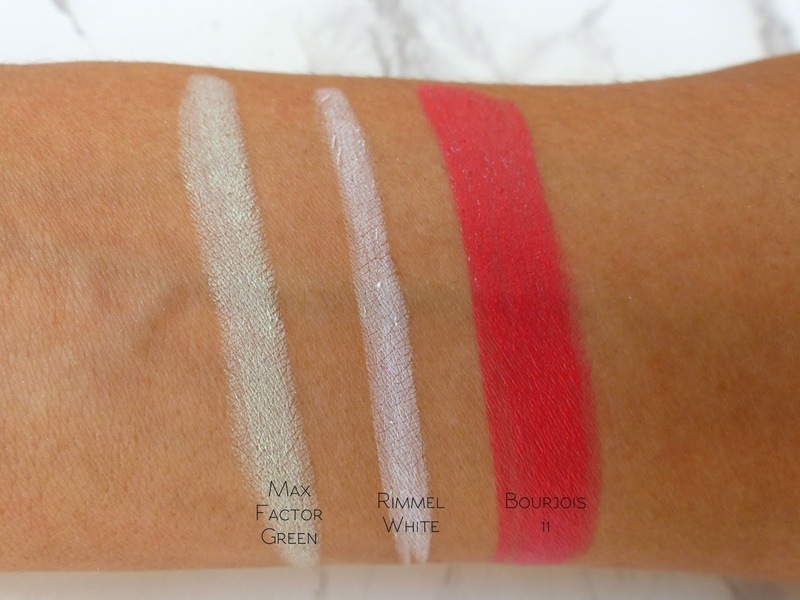 The Rimmel shimmer brick looks great, it's a shame they only have two colours though. A lot of brands still have trouble with diversity in their shades... But this seems to be a great alternative to the Bobbi Brown shimmer bricks, which look gorgeous but clearly less affordable haha! 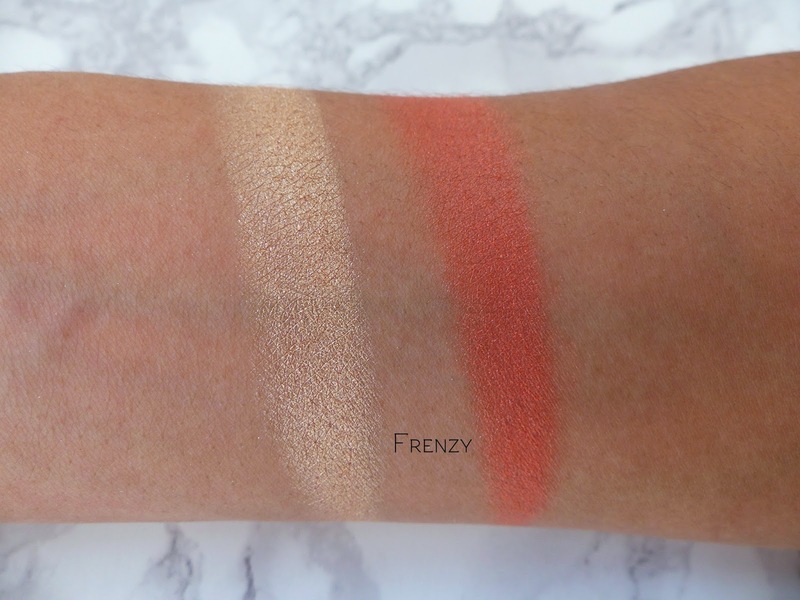 I was so close to ordering the NARS Dual Intensity blush but felt like none of the shades were 'me' however the swatches you've done of Frenzy are so so gorgeous!! I want that one now! I love the sound of pretty much everything here! I really want to pick up the smashbox palette most out of everything! Pixie cosmetics are soo good! It's a brand that never ceases to impress me! Hope you enjoy all of your purchases! I absolutely love Pixi gel tints and cheek products. These are so comfortable on my lips. I love the look of the Nars Dual Intensity Blush in Frenzy! Great purchases you made! Wow that is an amazing amount of products! I always love your posts for swatches - it's how I know which ones I want to buy! !